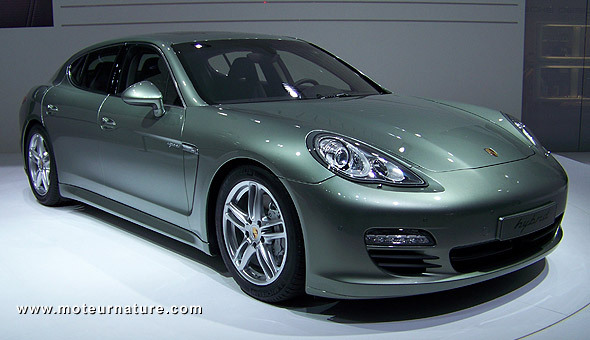 Porsche introduced an hybrid version of its Panamera sports sedan last month in Geneva. This model is the second hybrid from Porsche after the Cayenne, and there could a third one pretty soon. It would be a derivative of of the hybrid Panamera, with a plug. The German manufacturer is toying with the idea right now, the global mood being that it should be done just because it can be done quite easily. The main discussion is about the size of the trunk. Making a plug-in hybrid would ask for a bigger battery, and that would be done at the expense of the trunk’s volume. That should be a problem with some customers, as the Lexus GS450h, an hybrid that you can’t plug, has shown that some buyers don’t mind having very little space for their luggage. I believe this Lexus has the smallest trunk of any 4-door. If the Porsche isn’t worse, it’ll be fine as it will have the huge advantage of having a plug, and that it starts with a bigger trunk as the Lexus. Yet, you can’t expect a long range on battery power. Maybe only 15/20 miles. Not much, but probably enough for some buyers in Monte Carlo. Also those 15 miles would do a lot to help Porsche on the European corporate CO2 emissions average that every manufacturer has to meet… The decision about this plug-in hybrid Panamera should be taken this summer. If it gets the green light, as I believe it will, it should be available early 2013.